Reactive oxygen species (ROS) are a group of highly reactive oxygen-derived small molecules, such as superoxide (O2 • -), hydrogen peroxide (H2O2) and hydroxyl radical (OH•). ROS are typically formed through multiple reactions, starting with superoxide (1, 2). This is a known precursor of most ROS. The mitochondrial electron transport chain is the primary source of ROS in vivo. Here, leakage of electrons across the membrane to oxygen results in the generation of superoxide, which drives the formation of other oxidants. Generally, ROS are associated with cellular damage because they interact with a large number of molecules, including lipids, carbohydrates, proteins and DNA. This disrupts biochemical function and consequently ROS are tightly linked with ageing as well as different human diseases such as cancer and inflammatory-related pathologies. However, accumulating evidence points to physiological roles for ROS in host-defense, post translational modification of proteins, regulation of gene transcription, signaling and cell differentiation. This suggests that ROS are not only a byproduct of respiration but they are produced in a controlled fashion. Indeed, a group of enzymes has been identified, which are dedicated to the production of ROS in a variety of cells and tissues (1, 2). These enzymes belong to the NOX family of NADPH oxidases and are able to transport electrons across biological membranes to reduce molecular oxygen, resulting in the formation of superoxide and other ROS. NOX proteins are membrane proteins sharing a similar architecture, comprising a membrane-embedded helical domain made up of six transmembrane domains and a C-terminal cytosolic dehydrogenase domain. The helical domain contains two heme groups, while the dehydrogenase domain binds FAD and NADPH. Thus, NADPH oxidation and ROS formation occur on opposite sites of the membrane. In mammals the NOX family comprises several enzyme isoforms NOX1-5 and Duox1-2, which are expressed in different tissues and differ in their activities. For example, NOX1, 3 and 5 produce superoxide, while NOX2 (phagocyte NADPH oxidase) and Duox 1 and 2 generate hydrogen peroxide. Additionally, NOX1-4 exist as heterodimeric complex , while NOX1-3 are further associated with cytosolic partner proteins that regulate their activity (figure 1). 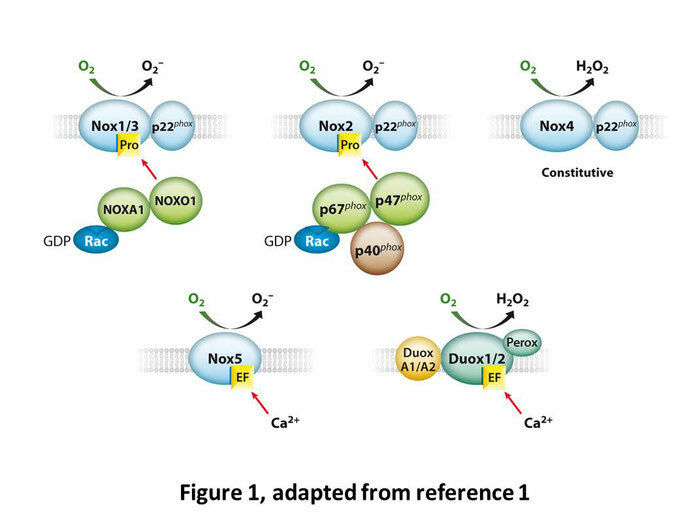 The activity of NOX5 and Duox1 and 2 is controlled by calcium binding. Unlike NOX1-3, NOX5 does not form a heterodimeric complex. However, Duox1 and 2 form an oligomeric complex with two other membrane proteins (DuoxA1 and A2). NOX enzymes are medically relevant for several reasons. Firstly, because of their role in cell differentiation and apoptosis. Secondly, ROS production is tightly associated with oncogene expression. Moreover, NOX1 and 4 are promising targets for anticancer therapeutics and inflammatory diseases, although their exploitation as therapeutic target is hampered by the lack of selective drugs. The protein data bank contains the structure of the NADPH-binding domain of human NOX2 (PDB 3A1F). However, this structure does not provide a comprehensive mechanistic insight of NOX enzymes nor potential leads for drug development. A complete understanding of NOX enzymes at the molecular level is therefore highly desired. Recently, the high-resolution structure of a NOX5 homologue from the cyanobacterium Cylindrospermum stagnale was reported. This enzyme is highly homologous to human NOX5 (40% sequence identity) and separate structures of its membrane-embedded and dehydrogenase domain were solved (3). Figure 2 shows the structure of the transmembrane domain (coloring according to secondary structure), which is composed of six membrane-integrated α-helices (red). The top of the figure corresponds to the outer face of the membrane, while the bottom resembles the cytoplasmic side. The two heme moieties are shown in yellow. Interestingly, one heme is located at the cytoplasmic side, whereas the other heme is situated near the outer face of the membrane. 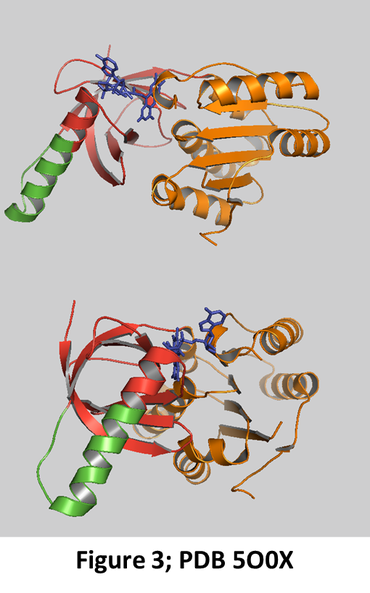 Moreover, this structure reveals a small cavity located above the outer heme made up of Arg256 and His317 (in blue) that comprises the oxygen-reacting center. This arrangement strongly suggests that electrons flow to the oxygen-binding cavity via the inner and outer heme, thereby reducing dioxygen. 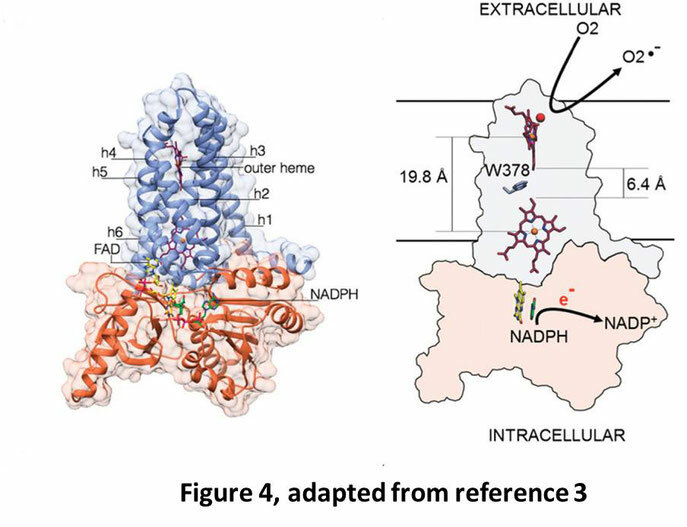 The structure of the cytoplasmic dehydrogenase domain is shown in figure 3 and reveals that it comprises a NADPH (orange) and FAD-binding region (red) with bound FAD (blue). The activity of human NOX5 is regulated by calcium through binding of calmodulin. Although bacteria do not contain this protein, the FAD-binding region contains a calmodulin-binding motif (green). 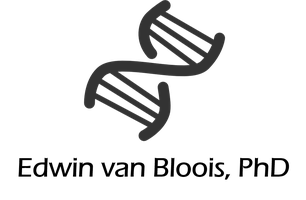 The reason why this conserved motif is retained is at present unclear and it can’t be excluded that it is required for control of enzymatic activity. The structures of the membrane-embedded and dehydrogenase domains were computationally docked to obtain a model of the complete enzyme (figure 4). This shows that the FAD is in close proximity to the inner heme and based on this a preferred path for NADPH-donated electrons was proposed. Following oxidation of NADPH, electrons are shuttled through the Flavin to the first heme moiety, and from there to the outer heme located beneath the oxygen-reacting center. Here, the electrons are transferred to bound dioxygen, which is thereby reduced to superoxide. Given the conserved nature of NOX enzymes, a similar catalytic mechanism may hold for all members of the NOX family of NADPH oxidases. Although initially known for their damage to biological systems, ROS play important physiological roles. These range from host-defense to signalling and cell differentiation. Moreover, NOX enzymes are also of therapeutic relevance because activation of oncogenes depends on ROS production and these proteins are potential targets for anticancer and anti-inflammatory drugs. The design of these drugs is hampered by the poor understanding of NOX enzymes. 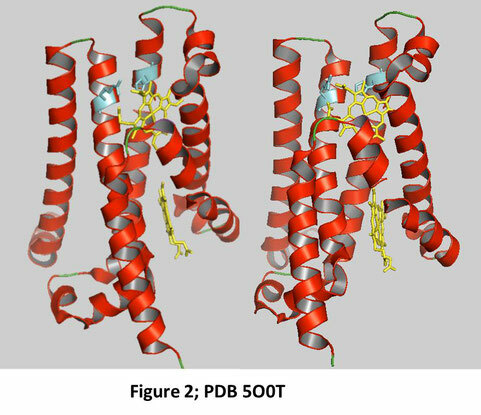 A detailed insight of these proteins at the molecular level is therefore highly desired. The structural analysis and model of the catalytic mechanism of NOX5 from C. stagnale will open up new avenues for the design of new drugs targeting members of the NOX family of NADPH oxidases. 1. Lambeth, J.D. et al. 2014. Nox enzymes and new thinking on reactive oxygen: a double- edged sword revisited. Annu Rev Pathol. 9: 119-145. 2. Bedard, K. et al. 2007. The NOX family of ROS-generating NADPH oxidases: physiology and pathophysiology. Physiol Rev. 87: 245-313. 3. Magnani, F. et al. 2017. Crystal structures and atomic model of NADPH oxidase. Proc Natl Acad Sci USA. 114: 6764-6.